Like any other developmental process, scribbling and coloring happen over a wide window of time. It usually starts at around 14 months and goes over 48+ months, when your child is ready to start using letters. At first your little one will start experimenting with crayons and do large shoulder movements. What might seem to be random scribbling will be her way of expressing and communicating with the outside world. She’ll then move on to a more controlled form of scribbling. You’ll see her making movements with her wrist, while her shoulder is steady. She’ll be able to trace lines, experiment with different grasps for the crayon or marker, and, eventually, hold them between her thumb and index. At around 25 months of age she’ll move on to more precise movements with her fingers. Her proprioceptive-kinesthetic awareness will show her how much pressure to put on each finger and how to separate them to get a better grip on the crayon. She’ll start making more complex patterns as she explores horizontal, vertical, and circular movements. She might not write actual letters, but with her precise movements she’ll show you the meaning in the dots, curves, and even letter components of her drawings. 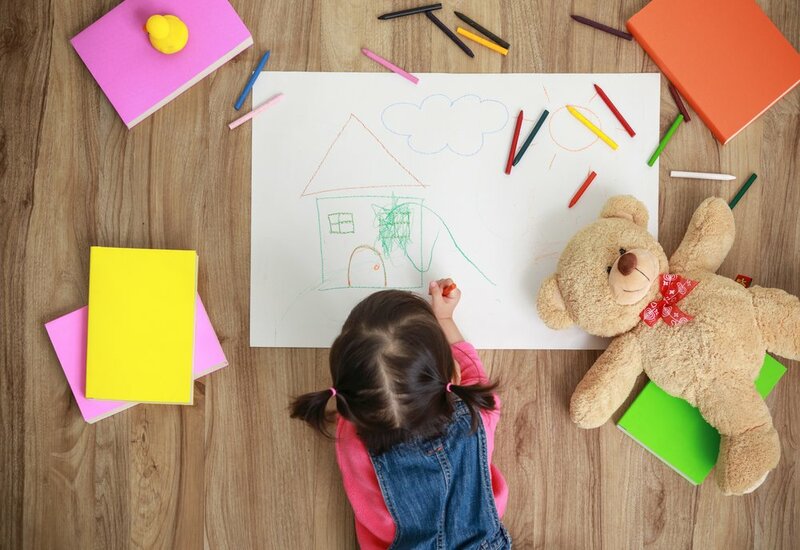 Keep reading part 2 of this article to learn how your little one transitions to more complex movements in her drawings.